You will start with gentle walking around the magnificent Mount Canigou, before finishing in the Mediterranean artists' village of Collioure. You will stay in lovely 3-star hotels and visit well-preserved monasteries, churches packed with Romanesque art, unspoilt villages and natural spas. A gentle, more Mediterranean climate with superb walking, and shorter or longer options most days. Transfers to ensure you only walk the best "bits". Almost daily visits to places of historic, cultural and artistic interest that range from 1,000 year old monasteries to one of Picasso's favourite fishing villages. High quality hotels, several with natural spa facilities, all with good quality regional cuisine. Use your own car to reduce the cost. Standard option: You make your own way to Molitg les Bains.You use your own car for transfers on days 2, 3 and 4, reducing the price considerably. With extra airport pick-up: We pick you up at Perpignan airport or railway station and take you to Molitg les Bains. Pick-ups also available from Toulouse, Carcassonne, Montpellier, Girona or Barcelona (please consult us for prices). Molitg Les Bains was once a pretigeous resort that still offers much of interest to today's visitors, including the many French who take what they call "the cure". You stay at the Grand Hotel, expensively styled and modernised with very comfortable rooms, a thermal spa (book treatments on arrival), and a very good restaurant specialising in regional cuisine. 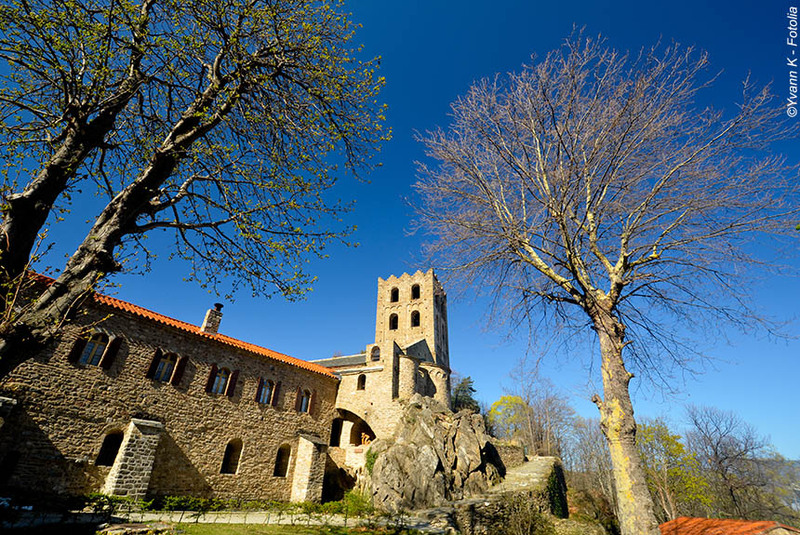 Today we again start with a short transfer, so you get the best of the most peaceful and pleasurable walk beside canals to visit the most acclaimed site of Catalan Romanesque art and architecture, the Benedictine abbey of Saint-Michel-de-Cuxa with its beautiful tower and 12th century cloister - one of the largest in the Pyrenees and, indeed, France. You can choose a there-and-back route, or make it a little more challenging - and rewarding - with a more circuitous route. See how you feel on the day. You stay a second night in Molitg les Bains at the three star Grand Hôtel. Walking time : 3h or 5h30. Distance : 8km or 15km. Elevation : + 300m or + 400m / - 300m or - 400m. Transfer time : 20 minutes. Another Benedictine abbey renowned for its Romanesque art - yet it could not be more different. 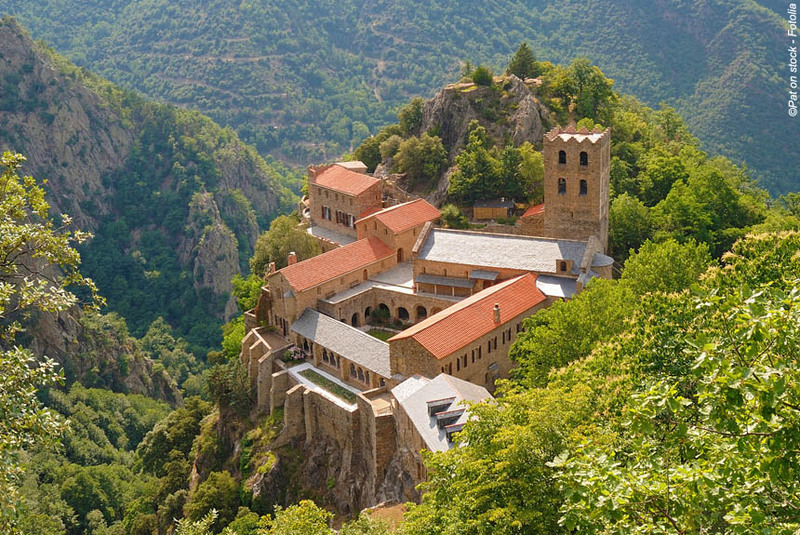 The 1,000 year old abbey (monastery really) of Saint-Martin-du-Canigou (founded 1009) is perched precipitously on a rocky promontory above huge cliffs, and clings vertiginously to Mount Canigou. It brings together themes of religion and nature, cultural history and agricultural survival, the ancient and the modern, faith and an absence of faith. It's a most memorable place to visit, especially as the culmination of a superb walk - or walks because again there are shorter and longer routes for you to choose from, and we provide transfers to ensure you enjoy walking the best parts of the routes. You spend a final night in Molitg les Bains at the three star Grand Hotel. Walking time : 2h or 3h30. Distance : 4km or 5,5km. Elevation : + 300m or + 600m / - 300m or - 300m. Transfer time : 40 minutes. 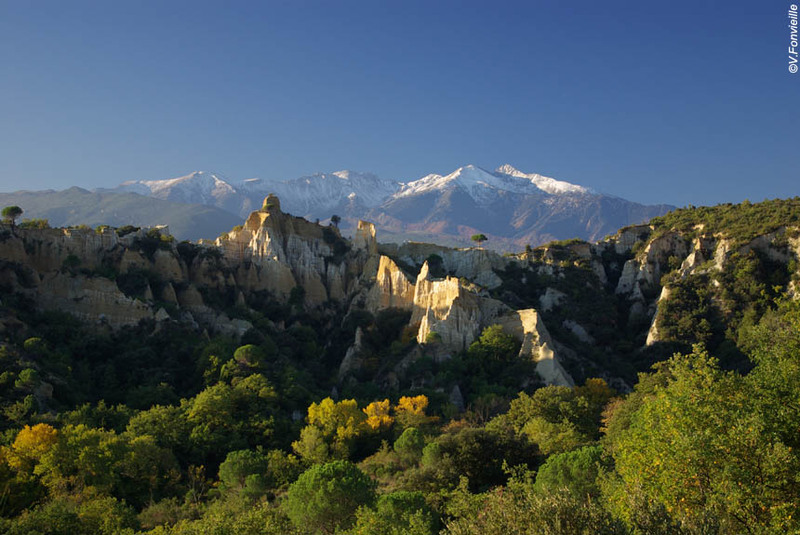 While staying at Molitg, you will have felt yourselves to be deep in the Pyrenees. Indeed you were, yet you were also only an hour from the Mediterranean coast, so for your final day we whisk you (or you whisk yourselves in your own car) to the vineyards and coves above the Mediterranean so you can walk to the delightful village of Collioure, much favoured by artists including Braque, Matisse, Picasso and Charles Rennie Mackintosh. 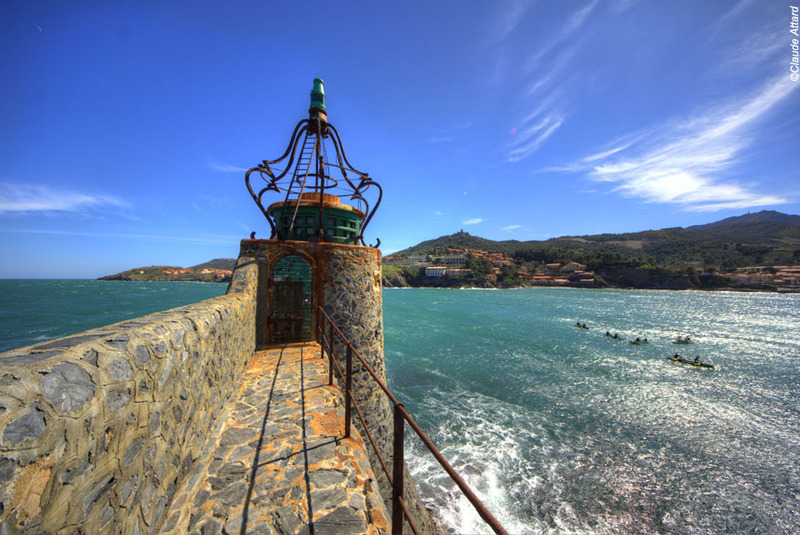 You can hike along the coast to Banyuls, from where a short transfer will bring you back to Collioure. This will give you a superb opportunity to compare and contrast medieval and modern art. The fishing village contrasts sharply with its castle walls lapped by the Mediterranean and the Pyrenean grandeur of Mount Canigou high above you (which you will be most familiar with by now). A fittingly artistic end to a holiday promoting the joys of the art of walking. Walking time : 3h. Distance : 8km. Elevation : + 450m / - 450m. Transfer time : 1 hour. Standard option: Your holiday ends after breakfast. 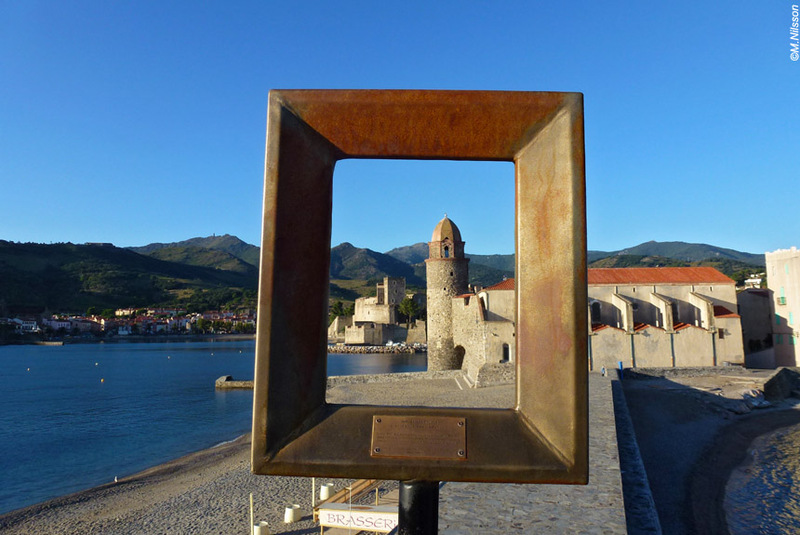 You should already have your car with you in Collioure, having used it for the rest of the week. With extra airport pick-up: After breakfast, we will take you back to Perpignan airport or railway station. Transfers also available to Toulouse, Carcassonne, Montpellier, Girona or Barcelona (please conult us for prices). 1 June to 30 October. Standard option: You make your own way to Molitg les Bains. You use your own car for transfers on days 2, 3 and 4, reducing the price considerably. This holiday features comfortable, gentle walking, and is suitable for anybody who enjoys "a good walk". On most days there are choices of itineraries so that you can decide for yourselves each day. It can get hot in July and August, as well as more crowded, but the temperatures are moderated by the mountains and sea breezes. We would recommend May, June and September as the best months. We will transfer your luggage between each hotel (unless you have opted for the self-drive option), so all you need to carry when walking is a daysack with whatever you regard as essentials. You stay in double or twin rooms for 4 nights in three star hotels. There is the option (for a supplement) of replacing the last night's three star hotel with a four star hotel with a one Michelin star restaurant. You will eat well. Dinners are based on set menus featuring regional specialities usually with 3 or 4 choices for each of three courses, but you can pay locally for upgraded choices. Breakfast is included every morning, but picnics are not as there are shops or cafes/restaurants to take or make the lunch of your choice - and, anyway, you can always ask the hotel the night before to make a picnic, which you can pay for locally. 4 nights dinner, bed and breakfast; people transfers; luggage transfers; detailed walking instructions; 1:25,000 IGN map; 24/7 customer phone service. The journey to the start point, and from the finish point; lunches or picnics; drinks with meals; non-standard menu items; entry fees; personal and travel insurance. "We have probably all heard of the Cathars, but do you know who they really were or where they came from ? 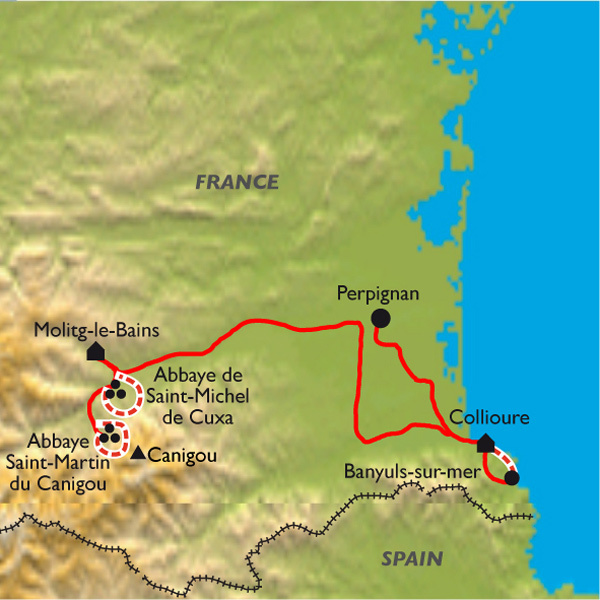 In fact the Cathars were a religious group that flourished in region of France known as the Languedoc from the 11th Century. One of the most famous of these castles is the Château de Montségur. If you decide on a walking holiday in this area, From Cathar Castles To Mediterranean Collioure, for example, a visit to this castle is an absolute must. "